The 2017 Nissan Pathfinder Platinum 4WD is equipped for adventure No other SUV in this class gives you the choice of 2WD, 4WD, and Auto Modes. Turn the available All-Mode® 4×4-i dial, located just behind the gearshift, to lock into 4WD on rough terrain and in varying weather. Turn it again to switch into 2WD for better mileage. The intuitive Auto Mode senses slippery roads or rough terrain and automatically adjusts power to each wheel. When things smooth out, it switches back to 2WD. 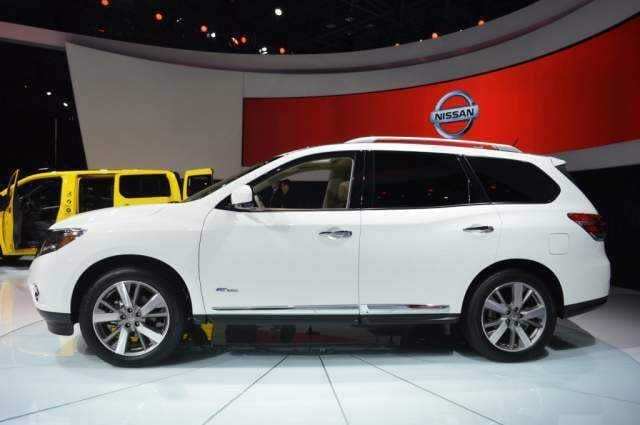 The Pathfinder features not one, not two but 7 Premium seats! Fill those seats up with seven passengers, and the Pathfinder still has room for up to 16 cubic feet of cargo. Drop the 3rd row and you’ve got more than 47 cubic feet, or drop both the 2nd and 3rd rows and you’ve got a virtually flat space with 79.8 cubic feet of cargo for your seriously big loads. There’s also a large under-floor storage area that keeps valuables out of sight. It’s easily accessed whether the 3rd row is folded or upright, giving added cargo room even when you have seven passengers along for the ride. A more rugged design greets you from every angle, while the signature character lines flow low on the body, providing a spacious interior filled with light. Strategically located spoilers and deflectors help improve Nissan Pathfinder’s aerodynamic performance – an athletic statement you’ll also appreciate when it comes to fuel efficiency. The Pathfinder has a towing capacity of up to 6,000 lbs. Thanks to its 20” wheels, hauling heavy loads become a lot easier. Their unique finish adds to the vehicle’s already bold presence. The standard roof rails feature optional crossbars, so you can haul everything from skis to bikes to kayaks wherever your next adventure takes you.